MOLAB, 2014 (1.) - brož., 116 str. 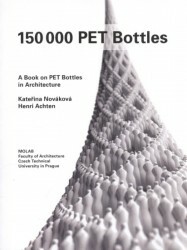 150 000 PET Bottles - A Book on PET Bottles in Architecture provides a comprehensive overview how a ubiquitous waste - PET bottles - can be applied in architecture. The motivations for this use range from providing cheap housing in poor or catastrophy-hit areas to interactive installations and pieces of art. The book is based on personal experience of the authors how to use PET bottles in their experimental design studio at the Faculty of Architecture of Czech Technical University in Prague. The book has nine parts: (1) How the authors became involved with PET bottles in architecture; (2) Brief history of PET material; (3) Material investigation of PET bottles; followed by comprehensive list of case studies (4) wet buildings (8 cases); (5) light structures (12 cases); (6) art (5 cases); (7) student work (7 cases); (8) parametric designs in a workshop for a PET-bottle tower (10 cases); and (9) conclusion. Sbírka příkladů boje s plastovým odpadem pomocí PET láhve v rukách designérů. PET láhev je fenoménem doby. Světová produkce tohoto artiklu však převyšuje jeho zpětný sběr a recyklaci, proto se plastová láhev stává problematickou. V rukách architektů se PET láhve mohou stát ovšem esteticky silným prvkem a obhájit svou existenci.